If you've been searching for a low-cost Android device on the Now Network, LG has got you covered. 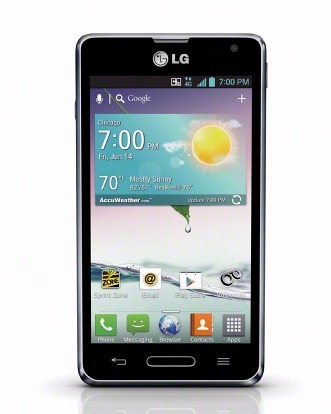 The previously leaked LG Optimus F3 is now official on Sprint, and it clocks in at just $29.99 after a 2-year contract and $50 mail-in rebate. That makes it the least expensive LTE handset on Sprint. This device is definitely entry-level with a 4-inch 800x480 LCD, a 1.2GHz dual-core ARM chip, a 5MP camera, 1080p video capture, WiFi direct, and LG's usual gaggle of Q apps. The battery is impressive at 2,460mAh, which should keep this modest device running for quite a while. And hey, it has LTE and runs Android 4.1.2. Now if only Sprint was farther along in its LTE rollout. Sprint will begin selling the phone on June 14 online, and in stores later this summer. Whenever it does hit retail, you can pick it up in silver or purple. Update: Sprint fixed its boo-boo and now we have the right UI on the phone.